Home News City Rent — How Do You Measure a Crisis? A landlord rents a leaky pool shed for $350 per month. A man lives with 20 other people and works four jobs to make rent. A woman was priced out of her rental after her husband died in an electrical fire caused by a neglected circuit breaker in their house. 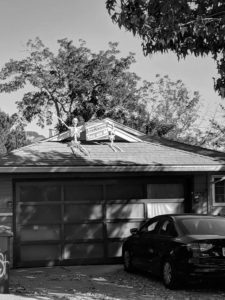 These grisly portraits of class struggle gathered by the No Place Like Home Project in Santa Cruz are testament to the state of affordable housing in the county. This crisis prompted one of the most contentious measures on the ballot this November — Measure M, the Santa Cruz Rent Control and Tenant Protection Act. Since it was placed on the ballot, high stake parties positioned themselves on either side of the vote. The Movement for Housing Justice (MHJ) rallies in favor of passing the measure, Santa Cruz Together (SCT) in opposition. 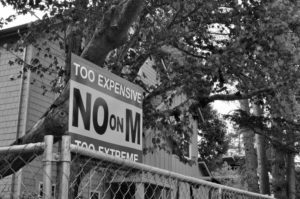 House on Meder Street, near the base of campus, proudly displays “No on M” signs. Skeletons hold up a “Yes on M” sign advocating for rent control. Photo courtesy of Lynne Okada. Measure M has three pillars, which proponents say offer a stabilization for the housing climate in the city of Santa Cruz. The first is a cap on annual rent increases in accordance with the San Francisco Bay Area Consumer Price Index (CPI) — typically between 1.2 and 3.6 percent. The second pillar would implement a list of just cause evictions that would prevent landlords from removing tenants without citing one of the formal reasons in the clause. Failure to pay rent, breach of lease and nuisance are the first three reasons listed, but owner move-in and withdrawal of unit from the rental market are also included. “Unless there are protections against evictions without cause, a landlord can just evict somebody and jack the rents up to whatever they want,” said Zav Hershfield, a local renter and organizer with MHJ and the Santa Cruz Tenant Organizing Committee. Finally, the third pillar of Measure M is the creation of an elected rent board to review disputes between tenants and landlords. The members of the rent board would serve a term of two years and have a self-determined salary. Home prices, interest rates and property taxes steadily increased as housing construction stagnated in the county in the past five years. As of 2017, almost 57 percent of residents in Santa Cruz are renters, and almost 70 percent experience rent burden, meaning they spend more than 30 percent of their monthly income on rent. One in four tenants report they spend nearly 70 percent of their income on rent. Jamie Kahn previously worked two jobs in Santa Cruz, but became houseless after facing a 40 percent rent increase which she could not afford. She explained because the housing market is so difficult to keep up with, once people fall behind, they often cannot catch up. “In Santa Cruz, people end up on the streets for the rest of their lives,” Kahn said. MHJ upholds that the measure, if passed, would alleviate some of the strain on the housing market in the city. “Predictable rents under rent control will help stabilize the living situations of the bedrock workers who make our city’s student- and tourism-based economy run, by allowing tenants to budget better for their futures,” reads the MHJ website. Santa Cruz Together, the campaign against Measure M, upholds that while the measure may appear to be an effective answer, it may also cause more problems. Peter Cook, board member of Santa Cruz Together and local real estate agent and property manager who rents to about 500 UCSC students, opposes the measure. If there is one consensus across the measure, it is that the affordable housing crisis in Santa Cruz requires a multi-pronged solution. In addition to M, several other ballot initiatives promise to make changes to the climate. On the local level, Measure H would approve a $140 million bond to construct affordable housing within the city, and on the statewide front Proposition 10 would repeal the Costa-Hawkins act, which prevents cities from placing rent control measures on units constructed after 1995. Santa Cruz is just one microcosm of the much greater housing crisis plaguing the state.